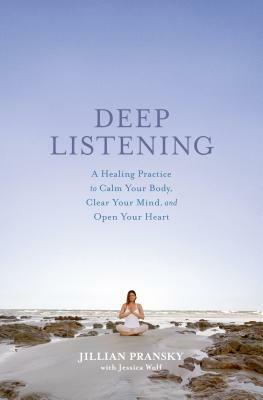 In Deep Listening, Pransky presents her signature Calm Body, Clear Mind, Open Heart program—a 10-step journey of self-exploration that she’s taught around the world. Derived from the techniques that healed her, the practice of Deep Listening invites you to pay close attention to your body, mind, and heart. You’re taught how to tune inward and relax into a state of openness, ease, and clarity. This is the new frontier in integrative wellness—mindfulness designed for healing. Jillian Pransky has taught mindfulness, yoga, and meditation for over 20 years. She serves as the Director of the Restorative Therapeutic Yoga Teacher Training for YogaWorks, and a guest teacher at many renowned holistic learning centers including Kripalu Center for Yoga and Health and the Omega Institute, Mohonk Mountain House, and Blue Spirit Retreat Center. Pransky lives in New Jersey with her husband, son, and their beloved Muppet-like dog, Sunday. Jessica Wolf is a writer and editor of creative nonfiction. She writes humor and essays on health, wellness, and parenting. Her work has appeared in The New York Times, Reader’s Digest, Huffington Post, and various blogs and literary magazines. She is also the editor of the cooking memoir Sweet Survival: Tales of Cooking and Coping by Laura Zinn Fromm. “This sweet book is the reminder, and nudge, we all need in these anxious times. It is at once a sweet, intimate memoir, a testimony to the potency of softness rather than the knee-jerk tendency to push-through everything, and a how to of meditations, intentions and restorative Yoga. Take your time with this one. There's no need to read it cover to cover: just open it up when you feel exhausted or lost—you’ll be glad you did.” -- Annie Carpenter, International Yoga Teachers, creator of SmartFLOW Yoga.